Hello again, I've been coding an IDT, ISR and an IRQ. But when the IDT is installed, my OS is frozen. Please be patient, especially with my horrible code. Preferably your INC files should be using the appropriate BITS directive. Oh, what a silly error I made! Serial communication does not work, and ISR does not work, I tried to divide by zero, the ISR should trigger, which should make the screen appear "Division by zero", but that doesn't happen! Your version is truncating the pointers to the interrupt handlers and sending the CPU off into neverland when interrupts occur. 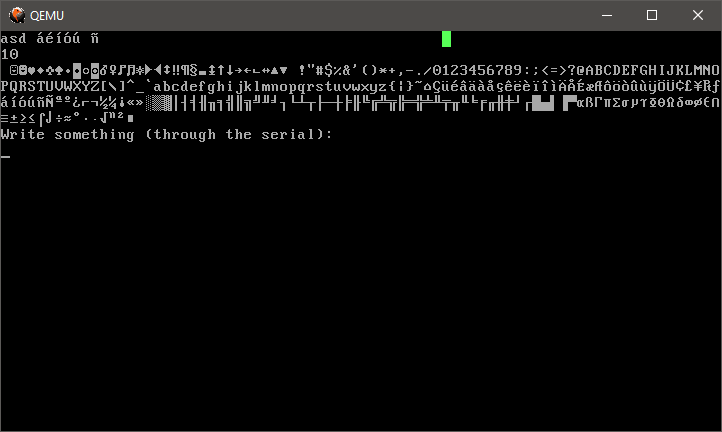 You may also wish to review the function irq_install. I don't believe the majority of the calls to idt_set_gate are using the correct first parameter. I also have a recommendation. A serious one. You should stop including non static functions as code from in header files. Non static functions should be placed in separate .c files and you compile them just like you did with kmain.c and then you add the extra objects to your linker line. I mentioned (a hint) in my previous comment about irq_install routine? You happened to map most of the IRQs to a single vector. Notice how the first parameter is all 32 except for the last one. IMHO They should be numbered 32 through 47. You've effectively overwritten entry 32 many times leaving most interrupts with no valid interrupt handler. Effectively iRQ1 through IRQ14 will fault when they occur. IRQ1 is the keyboard handler. IRQ0 and IRQ15 won't fault because they were actually initialised.